Our annual list of where to eat (and not break the bank) right now. Peruse restaurant menus these days, with their $32 burritos and $24 sandwiches, and you might think it’d be tough to get a decent meal on a budget in this town. Turns out that couldn’t be further from the truth—just flip the page. Herewith, our 100 favorite places to eat for $25 a person—or less. Also good: pork dumplings; Spicy beef noodle soup; scallion pancakes; fried chicken. There are a couple ways to go at this dining room devoted to Kabul-born owner Omar Masroor’s family recipes: tackle the menu small-plates-style, dabbling in salads and yogurt-topped dumplings, or satisfy your appetite with a single dish, exploring the complexities of, say, a velvety lawaan stew or even a lentil soup. Also good: Hot mazza assortment; lamb chops. At this pizzeria from the guys behind Olazzo and Gringos & Mariachis, we forgo the usual charcuterie platter in favor of the more creative vegetable board. The array—which could itself serve as dinner—includes roasted carrots with salsa verde and quinoa brittle, fried cauliflower, beets with mint, and whipped feta. When it comes to pies, it’s all about the bubbly-crusted Margherita. Also good: Buffalo Brussels sprouts; meatball sliders; fig-Gorgonzola-and-prosciutto flatbread; Alsace pizza with Gruyère and pancetta. At first glance, the menu at this BYOB Persian kebab house might give you sticker shock. While a $30 bison kebab will bust the budget, know that all plates are generous and shareable—and most are far more affordable. Bring pals and dig into chimichurri-painted chicken, ground-beef skewers, and perfectly blistered veggies, all alongside crisp flatbread and mountains of elaborately spiced rice. If you’re up for splurging, do it on the pomegranate-soaked lamb kebab. Also good: Eggplant dip; shirazi salad; shirin polo (rice with carrots and nuts); fesenjan (pomegranate-chicken stew). When a Yelper commented, “I must just be too white for this place. . . . They have nothing even similar to pad Thai,” the owners of this northern Thai gem proudly promoted the one-star review on its bathroom wall and sidewalk sign. Beef tossed with lemongrass and herbs, pork curry with pickled garlic, and vermicelli in chili-peanut sauce will make lovers of spicy, funky flavors forget all about Americanized takeout staples. Also good: Khao soi gai (chicken curry with egg noodles); pork and tomato-chili dip; chicken stuffed in tapioca skin. Northern Virginia is far from southern India, but a balmy corner of chef/owner Naresh Advani’s kitchen mimics the climate of his homeland—perfect for fermenting a dozen-odd doughs and batters for the restaurant’s menu of vegetarian dosas, chaats (crunchy snacks), and breads. If we had to pick one, it would be the masterful rava dosa—all crisp edges and soft corners, threaded with onion, cilantro, and chilies and served with a zesty vegetable stew. Round out the spread with a sumptuous samosa chaat or a balloon-like bhatura. Also good: Lemon rice; vegetable thali; paneer chili; mango lassi. The green sauce is key. The spicy, tart blend of jalapeño, cilantro, garlic, lemon, and spices works on just about everything—chicken-thigh kebabs; the comforting mashed-potato-and-leek-filled pastry known as bowlanee; and the stellar qabili palow,a heap of spiced rice, carrots, raisins, and hunks of lamb on the bone. About the only thing we don’t drizzle it on is mantu, savory pockets filled with beef and finished with yogurt and a tomato-lentil sauce. Also good: Vegetable platter; lamb or chicken carrayee; firnee (a sweet custard). We’ve tried fancy bánh mì on brioche and ciabatta—they’re not as good as the classic Vietnamese sandwiches on house-made rolls at this unassuming deli. The baguette is both airy and crackling, perfect for stuffing with pickled vegetables, fresh cucumber, cilantro, jalapeños, and swaths of mayonnaise and pâté. Pick from 20-plus fillings; we’re suckers for anything porky, such as barbecue bacon or fried bologna. Best part: Sandwiches are all less than $5. Also good: Sugarcane-shrimp bánh mì; sesame doughnut; avocado shake. This powerhouse trio helmed by executive chef Katsuya Fukushima serves up DC’s best ramen. Each spot has its own personality: Daikaya commands waits for its Sapporo-style bowls. Bantam King specializes in soothing chicken stocks and fried birds. And Haikan has fun with Old Bay–dusted crab Rangoon and quirky cocktails. At all three, though, the main affair is tangles of chewy noodles in slurp-worthy soup. Also Good: Gyoza at Daikaya and Bantam King; Japanese “deviled egg” at Haikan. Also good: Biscuits with pepper jelly; andouille-sausage dog; roast-beef po’ boy. The meal at this Ethiopian dining room starts with bread. No, not spongy injera but moist, crusted slices from a house-made loaf studded with black cumin seeds. It’s the first sign of good things coming out of this open kitchen. The special kitfo (beef tartare) is warmed just right with spices and herbed butter, and the rib-eye tibs stay juicy with a gentle sear—a far cry from the toughened nubs at many competitors. Also good: Veggie combo; shiro wat(powdered-chickpea stew); atkilt alicha (garlicky cabbage and carrots). The dish you’ll find on nearly every table at this Szechuan-centric restaurant: dry hot pot. Build your own bowl from a menu of 40 proteins and veggies—we like the pork-stuffed fish balls and the beef, but you can also opt for pork kidneys or boneless duck web. The ingredients are stir-fried with chilies and spices rather than simmered in a broth. Equally fragrant and complex is the Szechuan-style fish filet, which hides a mound of sprouts, wood-ear mushrooms, and slippery rice noodles under its lagoon of chili oil. Also good: Cucumber salad; cold steamed chicken with spicy oil. 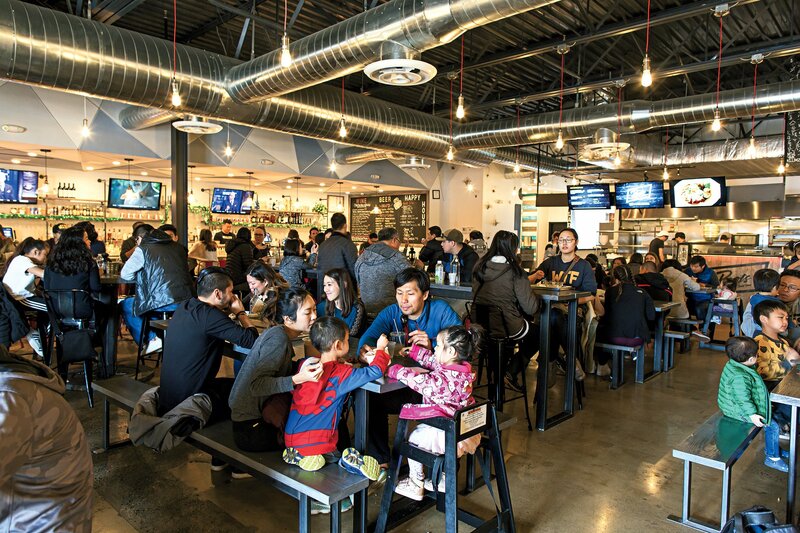 Washington is on the brink of a food-hall boom—a larger sister to this pan-Asian marketplace is slated to arrive in North Bethesda next year. Why? Spend hours eating and drinking through the six vendors here and you’ll understand. Start with a soju mule and fish-sauce wings at the bar before grazing on the likes of Thai street skewers at Roots; DIY Pokéworks bowls; and fusion comfort food such as garlic noodles with Parmesan, scallions, and shrimp at Balo Kitchen. Still standing? Munch’s doughnut ice-cream sandwiches are usually the tipping point. Also good: Taiwanese shaved ice at SnoCream; rice bowls at Balo Kitchen. Decades before the izakaya trend hit DC, this discreet, dark-wood-clad restaurant was turning out the kind of meals you might find down a Tokyo back alley. It’s easy to splurge—especially on sushi and seasonal specials—but budget diners can still eat well. Home in on the excellent teishoku, set meals that include entrées like miso-marinated fish and three sides (such as spinach oshitashi or marinated tofu), plus miso soup, rice, gingery salad, and sashimi come evening. Lunch brings even more delicious deals. Also good: Seafood sunomono; assorted tempura; sushi sets. Peer through the kitchen window and you’ll see the staff methodically stuffing and folding dumplings. Hint, hint. In particular, this cash-only restaurant is known for soup dumplings so flavorful they don’t need the accompanying dipping vinegar. The checklist menu of 100-plus Cantonese, Szechuan, and Taiwanese small plates can be intimidating to navigate, but you’ll feel like a pro ordering the fragrant lamb with cumin and the spicy fried tofu with Doritos-like crackle and color. Also good: Szechuan-style beef noodle soup; preserved egg with tofu; spicy pork wontons. Build an appetite—and stack of napkins—before digging into one of chef Jon Taub’s brawny sandwiches, all available by the half (a meal) or whole (guaranteed leftovers). There’s nothing fussy about the snug family-run joint, but Taub’s finer-dining background gleams in arm-drippers such as Chicago-style Italian beef with slow-braised brisket, giardiniera, and tangy provolone. That said, the Philly native makes a mean cheese­steak, too. Also good: Fried-whiting hoagie; Italian hoagie; Italian water ice. A tortilla can make or break a taco. 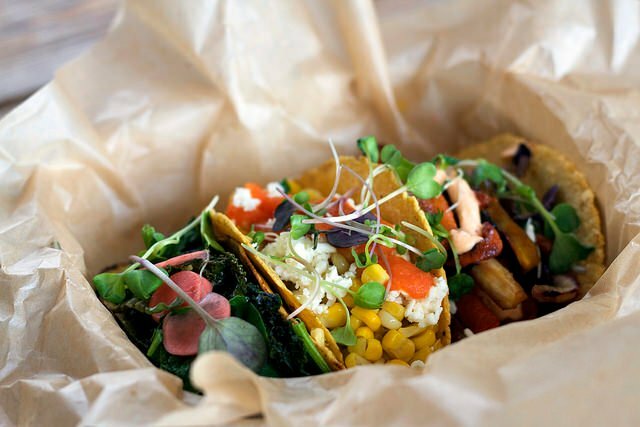 So at this vegetarian “farm to taco” shop in Georgetown, sunny rounds are house-made with organic, gluten-free masa and griddled to order, then stuffed with seasonal combinations such as roasted zucchini, goat cheese, and chipotle yogurt or smoky collards with paprika salsa. It’s easy to channel Tulum in the airy space, so order a rosé or a fresh-pressed juice and relax. A larger sister taqueria is slated for Mount Vernon Triangle this year. Also good: Potato-and-kale taco; black beans and green rice; weekend egg tacos. This sun-yellow Ethiopian spot in Shaw—also on our list of 100 Very Best Restaurants—recently got a spiffy Bethesda sibling. (The place took over a mod-American bistro and changed nary a succulent.) At both places, the kitchen puts out vegan platters that taste almost Technicolor: String beans and carrots are so exuberantly flavorful, it’s hard to recognize them. Still, we never leave without an order of kitfo, chopped raw beef seasoned with mitmita (chili powder) and crumbles of house-made cheese. Also good: Sambosas (lentil turnovers); doro wat; beef tibs. Many people know this bare-bones mainstay by its nickname, Mama’s Dumplings, and for good reason—the freshly folded and pinched bundles, sold by the dozen and steamed or pan-fried to order, are delightful whether stuffed with shrimp and chive, pork and cabbage, or beef and celery. Pro tip: Order an uncooked bag to stick in the freezer for when the inevitable craving strikes later. Also good: Mama’s special dumpling; green-onion pancake; Beijing soy-sauce noodles. Focus on the menu under the glass tabletop and the handwritten signs on the wall—that’s where you’ll find Peking duck, crunchy “kingdom” pork chops, and Hong Kong shrimp blitzed with green pep-per. We like to kick things off with a round of pork dumplings wrapped in house-made dough. Also good: Fish with chive flower, lotus root, and black-bean sauce; Kung Pao chicken; mapotofu; tofu eggplant. Also good: Cuban sandwich; media noche sandwich; picadillo empanada. James Alefantis’s pizzeria is part late-night music venue, part neighborhood kiddo gathering place, part Ping Pong room. We’re here for the pizza, on thinly stretched, lightly charred dough. The crust is terrific, but what sets the pies apart most is the sauce from Toigo Farms tomatoes. It perks up everything from meatballs to garlic knots. Don’t skip the jerk-style wings with creamy horseradish dip. In fact, get an extra cup—it doubles as the perfect accessory for that pizza crust. Also good: Lentil salad; Yalie pizza (clams and lemon); Stanley pizza (fennel sausage and roasted red peppers); Dream pizza (apple and Gorgonzola). Craving schnitzel? Head to these Bosnian/German dining rooms for expertly fried renditions of this Eastern European favorite—we like the veal versions with a fried egg on top or stuffed with spicy peppers and feta. The sleeper hit is the spaetzle, a marvelous vehicle for veal-and-mushroom stew or sautéed onions and melty cheese. Also good: Bosnia burger; ćevapčići (sausages); crepes with rose-hip jam and whipped cream. It’s Saturday night and the string-lit patio and the oxblood-red dining room are bumping. Start with a mojito and a round of garlicky shrimp perched on wedges of avocado. Then move on to robust plates of picadillo, a hash of ground beef, olives, and potatoes, or lechón, fork-tender roast pork. Sides such as tostones and black beans and rice are every bit as worthy as the mains. Also good: Ropa vieja; oxtail in Creole jus; tres leches cake. A glass case of Pakistani sweets welcomes you inside this storefront. The cooking, meanwhile, delivers lightning bolts of heat. You’d expect this of the chili-laced karahi dishes—we like the bone-in chicken and goat versions—but innocent-sounding lamb chops and biryani are laced with fire, too. The $13.95 weekend buffet, an array of curries and other morsels, rightfully draws a crowd. Also good: Chicken pakora; chapli (ground beef) kebab. Restaurants often self-hype—here you’ll find “planet’s best beans”—but the many winning barbecue-battle banners hanging at this place are proof of champion flavors (and the brisket-laced beans are indeed out of this world). Owners Ahmad and Aladdin Ashkar specialize in dry-rubbed, wood-smoked meats from their native Kansas City; don’t miss the burnt ends, hunks of brisket caramelized in spicy-sweet sauce. Still, you won’t go wrong with more elaborate creations—a smoked, brisket-stuffed potato smothered in cheese—or the tasty sides. Also good: Pulled chicken; brisket sandwich with american cheese and onion rings; slaw; wings. If you’re new to Uyghur food, order up some “big plate chicken,” one of the star dishes here. The immense platter of chewy, hand-pulled noodles topped with warmly spiced gravy and hunks of bone-in chicken, potato, and peppers is a fusion of Chinese and Middle Eastern influences. (Uyghurs are a Muslim minority of Turkic descent in western China.) Bring a sizable group—this dish is the first of many worth exploring. Also good: Samsa (minced-beef pastries); cumin lamb kebabs;manta (dumplings); laghman (noodles with beef and vegetables). It’s tempting to tear through the Japanese rice bowls at these spots—they’re that tasty. But slow down and you’ll marvel at the elements inside: the sticky short-grain rice, the beautifully fried meats (go for soy-sauce-marinated chicken or thin slabs of pork), and either of the two sauces—the sweet donburi glaze or the addictive curry. Also good: Fried shrimp; salmon sashimi; bowl with thinly sliced rib eye; eel bowl. Eerkin’s pleasant dining rooms can feel like a journey that stretches from Central Asia (cilantro-scattered eggplant salad) to the Middle East (a hefty bone-in lamb shank simmered in onion sauce with naan, thicker and dryer than its Indian counterpart and better for sponging up sauces). One required stop on the trip: hand-pulled laghman noodles. Also good: Cucumber salad; lamb skewers; pulao (rice with carrots, raisins, and lamb); manta (dumplings); Uyghur tea. We’d be happy with a plate of pad see ew—even takeout staples like those soy-sauced noodles are done better here—but the kitchen’s showstoppers are on the side of the menu labeled “serious authentic Thai cooking.” That’s where you’ll find a smoky stir-fry of Chinese broccoli and marinated beef, a bright and spicy banana-blossom salad, and perhaps best of all, almost ethereally crunchy fried shrimp with tamarind. Also good: Fried-watercress salad; fried whole fish with green mango; sticky rice with custard. Good luck finding tortillas as good as the ones here. At hole-in-the-wall El Sol and the more atmospheric Mezcalero, small batches of masa are made every few hours and pressed to order into pliable, sheet-thin disks. The tortillas make an ideal foundation for lengua or carnitas tacos, or for stretchy strands of bubbling queso fundido. Chef Alfredo Solis and his sister Jessica also do their Mexico City roots proud with a standout ceviche de pescado and mole rojo chicken. Also good: Chile relleno; guacamole; chorizo-and-potato sandwich. A lot of Ethiopian menus can feel similar, so it’s the details that define the standouts. At this Alexandria favorite, it’s the texture of the lentils and split peas (not too mushy) and the richness of the shiro (powdered-chickpea stew) that make one of the most memorable vegetarian samplers around. Further proof that vegetables reign supreme: The meaty pan-fried mushroom tibs with jalapeño outshine even the knockout beef-tenderloin version. Also good: Kitfo (raw minced beef); dullet (diced lamb tripe and liver). Shrimp is a rarity on local Ethiopian menus, but it appears in tomatoey stew with onions and jalapeños at this Crystal City restaurant. It also happens to be one of the best dishes on the Ethio-Eritrean menu. You’ll likewise want to sop up the veggie combo, particularly the spicy red lentils and yellow split peas with a caramelized sweetness reminiscent of Thanksgiving yams. Also good: Potato-and-lentil or beef sambusas; meat lovers’ combo, including beef tibs and beef zigny (a brisket-like stew). There are lots of reasons to visit this stylish Egyptian cafe—organic ingredients, a lively patio out back, the fact that a share of profits goes to charity. Then there’s the actual cooking, which includes beautifully spiced meat pies and falafel, plus a take on mac and cheese with béchamel and zesty meat. Also good: Lamb-and-beef kofta; koshary (lentils and pasta in tomato sauce); slow-cooked fava beans; doughnuts. Taking a vegetarian to a barbecue joint is usually like sending a lamb to, well, you know. Credit chef turned pit master Rob Sonderman for making all feel welcome and well fed at his shoebox-size spot. While there are always worthy veggie sides and specials, his smoked meats—moist brisket, pork ribs, and rib tips—are some of the best around, as are house-made sauces (try sticky garlic or spicy barbecue). Look out for rotating sandwiches, whether you’re more of a smoked-lamb-and-avocado fan or a tofu-“bacon”-BLT person. Also good: Mac and cheese; wings; club sandwich; banana pudding. It’s tempting to stick to the list of proven hits—say, the justly famous shrimp-dumpling soup—but this Hong Kong–style eatery is the sort of place where you can order with abandon. Pan-fried whole cod, spooned with ginger-scallion soy sauce, is a worthy detour. So, too, a platter of glossy roast duck, pork, and soy-sauce chicken. Also good: Beef-with-black-pepper casserole; clams in black-bean sauce; chicken-with-eggplant casserole. Ramen purists might balk at Gaijin (“foreigner” in Japanese) with its amped-up bar snacks—say yes to smothered kimchee fries—20-plus ramen bowls, and umpteen toppings. Owners Nicole Mazkour and Tuvan Pham (an Army alum and Vietnamese expat, respectively) aren’t your typical ramen masters. But the complex broths, springy noodles, and spice pastes are all expertly house-made, and we’d pit their unorthodox fried soft-shell Crabbin’ Ramen against traditional chasu pork any day. Also good: Steamed buns; hatcho black-miso ramen; tonkotsu ramen. As a grocery, Glen’s is no discount destination—credit grocer Danielle Vogel’s commitment to local products and environmental health. As a cafe, it’s one of the top sources of seasonal, wallet-friendly fare. Health nuts can load up on mixed salad plates (we love the kale and the tahini tuna), while the healthyish go for sandwiches such as a house-roasted-turkey club. Not feeling virtuous? The thin pizzas are delicious, grilled cheese and tomato soup is one of the best pairings in town, and pints such as Port City Optimal Wit are forever $4. Also good: No. 7 pizza (with salami, mushroom, and pickled jalapeños); soba-and-kimchee salad. Many restaurants serve homey food, but few capture the essence of a communal table like this cozy Korean spot. 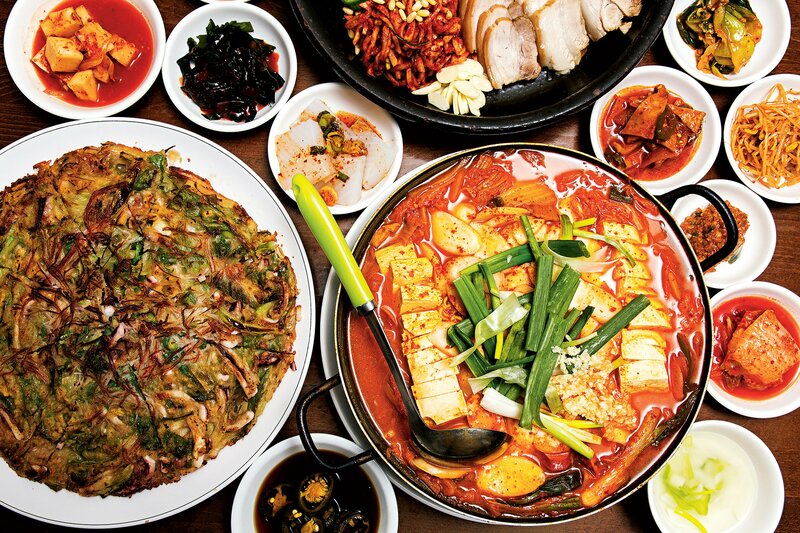 Portions, doled out by attentive servers, run extended-family size: platters heaped with mandu (dumplings) or slices of pork bo ssam and kimchee ready to be wrapped in steamed cabbage leaves. Soul-ful stews such as doenjang-jjigae are a sought-out specialty; the heady brew of fermented soybean paste and vegetables is a cure-all for fussy babies and hangovers alike. Also good: Seafood pancake; bibim guksoo (cold noodles with kimchee and egg); sul leung tang (ox-bone broth); bibimbap. An enormous cauldron of simmering broth signals you’re in the right place at this sole Korean spot in the mostly Vietnamese Eden Center. Come here for the hot and cold soups. (We’ve found better mandu and barbecue elsewhere.) Sul leung tang, a milky broth that diners season at the table with salt, spices, and (our favorite) kimchee juice, is liquid comfort—and a feast when garnished with hulking beef ribs. Bring a group for one of the generous hot pots such as spicy seafood-and-tofu, which servers leave bubbling on tabletop burners. Also good: Sausage-and-noodle hot pot; stir-fried squid; naengmyeon (cold noodle soup). Who needs brunch when you can have dim sum? Families crowd this banquet room on weekends for the joys of shu mai and other Cantonese specialties ferried around on carts. It’s easy to fill up on shrimp rice-noodle rolls and translucent-skinned chive dumplings, but you’ll also want to hail a bowl of tender braised beef tripe or sweetened custard-like tofu. Also good: Fried taro-shrimp cakes; crispy pork belly; stuffed eggplant. You can never replicate an institution, but elements come close—at least in fla-vor and friendly wel­-come—at the first Washington-area franchise of the legendary Tennessee fried-chicken joint (now with 20-plus locations). We’re starstruck by the crackling pieces of white and dark meat, tinged ochre by spices that burn as slow as the classic soul playing in the background. Sides are bit players—decent collards, mac and cheese, slaw—though it’s worth lingering for chocolate chess pie. Also good: Fried green tomatoes; fried pickles; root-beer float. When it comes to summer cookouts, the hot dog often gets overshadowed by the burger as a vehicle for creativity. But this Old Town cafe—lined with photos of terriers and retrievers—proves just how exciting a frank can be. Exhibit A: the Bombshell, done up with onions, mango-pineapple relish, and jalapeños. Still, the place does an admirable set of cheeseburger sliders, too. Also good: Bánh mì dog; Duck Duck dog; Chicago dog; lamb sausage; sweet-potato fries. The Texas kitsch can make this Penn Quarter dining hall feel gimmicky, but the barbecue is the real deal. Chef Dan Far-ber smokes his brisket for about 15 hours on pure Texan post oak—with no set-and-forget gas or electri-cal assist, as at many urban barbecue joints. The result tastes straight out of the Lone Star State. The sides are all easy to like, but we’d give an edge to the refreshing cucumber salad and (when it’s in season) creamy corn pudding. Also good: Jalapeño-cheese sausage; pulled pork; baked beans with burnt ends. The party never stops at these late-night Korean barbecue houses, even in the bathrooms, where K-pop jangles. The decor is no-frills, but the theatrics of tabletop grilling are in full effect. Watch servers heap pounds of marinated meats and seafood—pork belly, spicy beef and octopus—on sizzling grills, then hew the Flintstonian hunks with scissors. 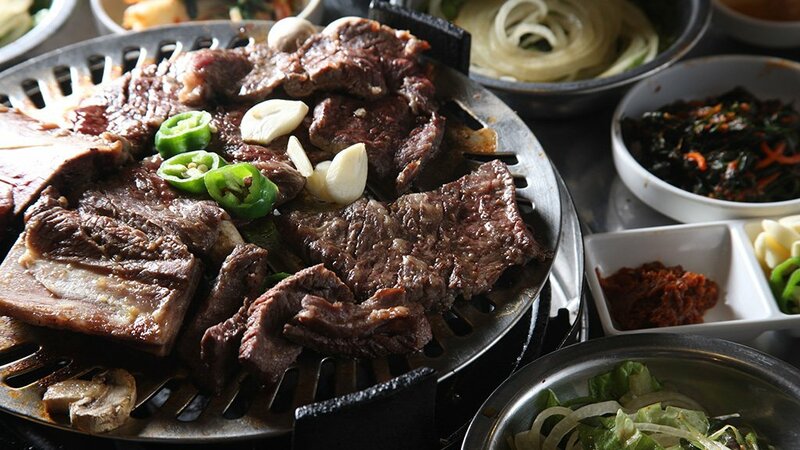 It’s worth splurging on LA-style galbi—marbled beef short ribs—and of course, a few rounds of Hite beer and soju. Also good: Pan-fried mandu (dumplings); seafood pancake; naengmyeon (cold noodle soup). The vast menu at this cash-only Eden Center institution means there’s always something new to discover. Noodle soup with five-spice duck is one such treasure, and it’s best eaten in two parts: Dip the duck in plum/Sriracha sauce, then move on to the thin egg noodles in a rich duck broth. Another sleeper hit: suon ram sa ot, grilled hunks of pork chop in a fragrant lemongrass-chili sauce that warms the tongue. Also good: Shrimp-filled rice crepe; bo luc lac (shaking beef); vermicelli with spring rolls and grilled pork. This leaf-green cafe brings it when it comes to both kebabs and other savory Afghan plates. Aushak and mantu, ravioli-like pillows filled with leeks or ground beef, are plump and delicious with dabs of meat sauce and yogurt. There are small details that matter, too: warm, just-made naan and an eye-popping sauce rife with hot green chilies. Also good: Chopan (ground beef) kebab; qabili palow (rice with carrots and lamb); eggplant bouranee. Arin Lapakulchai’s tiny storefront—the lone Thai restaurant in the mainly Vietnamese Eden Center—isn’t the most boundary-pushing kitchen around. Instead, the chef turns out quietly thrilling renditions of takeout standards—succulent chicken satay, flaky curry-filled empanadas, vivid drunken noodles. That’s not to say her shortlist of hits shies away from spice: Ask for things Thai hot and she’ll more than oblige. Also good: Pad see ew; eggplant with ground pork; crispy pork belly with string beans; khao soi. If ever there was a place to give lamb brains a whirl, it’s this Pakistani kebab house, where the creamy delicacy is presented in a spicy karahi with tomato and herbs. (Just be sure to call a few hours ahead to order it.) Spiced and marinated whole chicken is a tamer pick but no less tasty. Don’t bypass the flatbread on the side. The bread maker is almost balletic in his flipping, stretching, and slapping of dough. Also good: Bone-in chicken karahi; Lahori-style fried fish; chicken keema (chicken-and-potato hash; Thursday only). This family-run Korean barbecue spot is also a regular amid the pricey places on our 100 Very Best Restaurants list. Credit richly marinated, high-quality meats such as miso pork belly or sliced duck; gratis extras including vibrant panchan (vegetable dishes), egg custard, and fiery red pepper soup; and niceties like powerful smoke-inhaling vents. Also good: Fried rice cakes; fatty brisket with bean sprouts; bibim naengmyeon(spicy cold noodles). Don’t let the tantalizing rows of baked goods fool you—this is so much more than just a sweets spot. A small kitchen turns out restorative chicken posole verde; simple and terrific street-style tacos; and textbook sopes piled with beans, avocado, and shredded lettuce (when it comes to proteins, we love the carnitas or carne asada). Tortas (sandwiches), served on warm house-baked rolls, are always worth getting. Also good: Mexi-Cuban torta; shrimp tacos; pupusas revueltas. Vegetables and stews don’t come by default on a platter of injera at this casually chic Ethiopian spot but are served in a spread of individual ramekins. You might even get a serving spoon. That’s not to say Letena puts out a watered-down version of the cuisine—if anything, the flavors are amped up. Red lentils are stewed in a fiery berbere sauce, while doro wat takes on a barbecue-like sweetness. Even the injera (folded up on a plate) is extra tangy. Also good: Timtam salad; kay siga wat (spicy beef stew); yetamese (seasoned lean ground beef). At this Eden Center outlet of the Northern China–based hot-pot chain, your first order of business is picking a broth. Chili-laced spicy or the mild “original,” bobbing with spices such as cardamom pods? (We go half-and-half.) Then you accessorize it with raw ingredients you cook yourself in the bubbling liquid. Take a cue from the place’s name and focus on the ovine offerings, including shaved lamb shoulder and lamb wontons, then load up on veggies (bok choy, spinach, mushrooms of every kind), glass noodles, and tofu. Also good: Lamb skewers; watermelon juice. You don’t come to this Eden Center dining room for the stuff every Vietnamese place slings—get your shaking-beef fix somewhere else. Instead, focus on lesser-seen dishes such as grilled eggplant with lemongrass beef and fried whole flounder with ginger sauce. One exception to the rule: the ubiquitous bánh xèo rice crepe, folded into a half moon and presented with a bouquet of herbs. You don’t want to leave without one. Also good: Sautéed clams with sesame crackers; bun cha (Hanoi-style grilled pork with vermicelli); caramel fish. 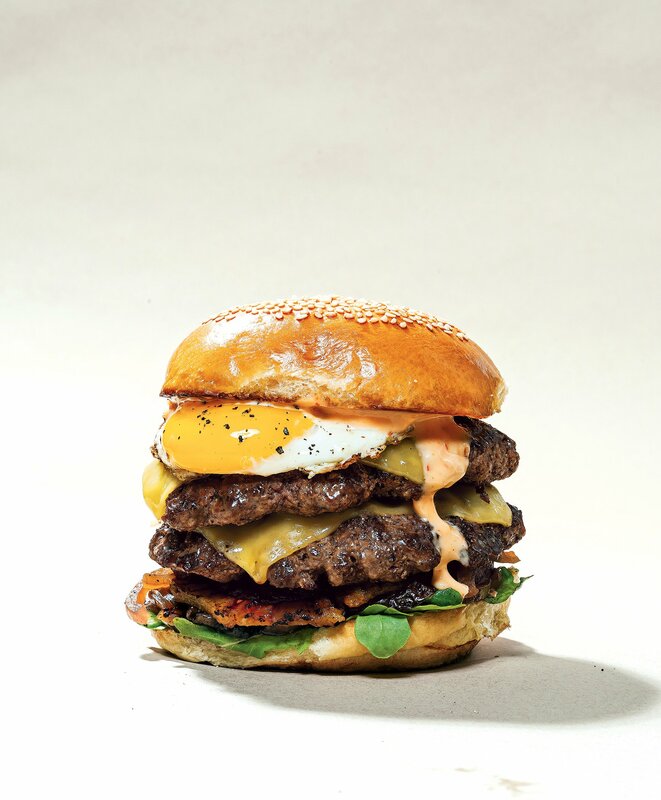 Who makes the best burgers in DC right now? That’d be Alex McCoy, a Washington-born talent of British blood who has traveled extensively in Southeast Asia. At his funky Adams Morgan pub, the menu of Creekstone patties (and chicken sandwiches) reads like a travel log. Eating is no dainty affair—the Lucky Bun is a delicious mess of griddled meat, Gouda, grilled onion, arugula, and chili aïoli, while the best chips (a.k.a. fries) come smothered in tangy curry. Grab a few friends—and napkins—and make a night of it. Also good: Fried-chicken katsu sandwich; ‘Alfie’s Bun” burger; Javan salad. “Alfie’s Bun” at Lucky Buns. Photograph by Scott Suchman Food styling by Nicole Bryant at The Artist Agency. This Bolivian restaurant is especially popular with big groups, and once you see the plates, you’ll know why. There’s the awe-inspiring parrillada—piled with grilled short ribs, blood sausage, flank steak, cow intestines, and pork sausage—which could feed four. On weekends, gather the troops for specials such as roast pig with plantains and an earthy pork-and-intestine stew. Also good: Salteñas (soup-filled turnovers); silpancho (breaded and fried steak). Cocktails and creative dishes such as tuna tartare “kitfo,” mush-room tibs, and avocado-tomato salad make this newcomer stand out from its Ethiopian-restaurant competition. Chef Senait Tedla’s cooking shines for its good-quality ingredients and depth of flavor, whether she’s taking on classics—wine-and-rosemary-scented lamb tibs, moist fried fish—or toying around with innovations. Mixed platters let you sample widely, though it’s equally pleasurable to immerse yourself in a single dish. Also good: Sambusa; doro wat; kitfo; vegetarian platter. Of the handful of Yemeni restaurants here, this one shines brightest. The cuisine emphasizes the beauty of slow cooking. Roasted-lamb or chicken mandi are fall-apart tender, their onions richly caramelized atop beds of rice. Bubbling stews such as fahsa (shredded beef with vegetables) stand out for depth of flavor. Like most dishes in the spacious dining room, shafout easily serves four—not that you’ll want to share the wheel of injera-like bread covered with chilled cucumber-herb yogurt and pomegranate seeds. Also good: hummus with lamb; haneeth (lamb with rice); susi (a sweet-savory casserole with honey); Minted lime juice. At a time when novella-thin diner-style burgers proliferate, these patties are unapologetically big and juicy, with the savor of a good steak. The locally raised Angus beef doesn’t need much, but toppings are well thought out: There are three kinds of mustards and mayos to choose from, plus house-made pickles and, in season, locally foraged ramps. Also good: Sweet-potato fries; milkshakes. Also good: Crabcake with eggs and grits; fried green tomatoes; fried-rockfish sandwich. Sure, Bad Saint draws hours-long lines for its elevated Filipino fare, but for homestyle renditions, we haven’t found anything better than Raymond Domingo’s snug strip-mall restaurant. We’d come for the sisig alone—the hash-like mix of pork belly, onions, and chicken liver arrives sizzling on a platter. A daily buffet is good for sampling but doesn’t include some of the star dishes—specifically, crisp pata with vinegar sauce. The whole pork leg has been braised until fork-tender and deep-fried until crackling. Also good: Pork barbecue skewers; stuffed squid; mixed pancit (noodles); chicken adobo; fried banana with taro ice cream. 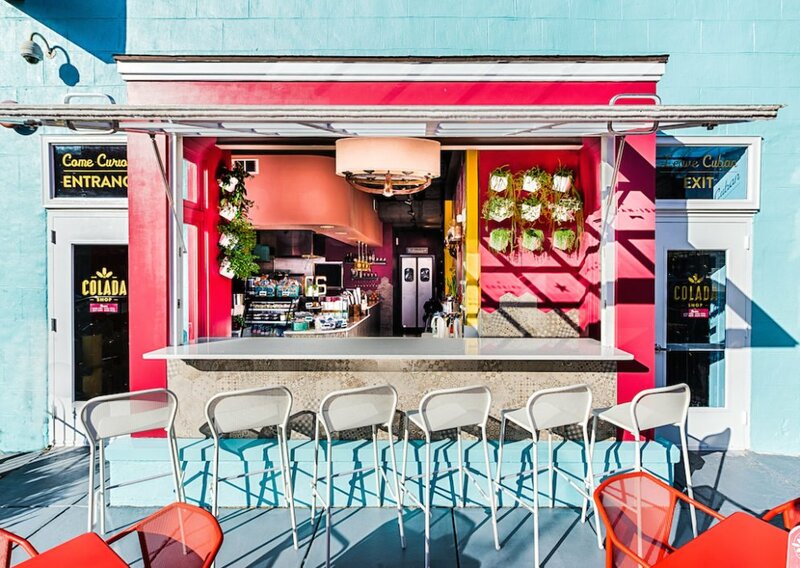 Settle into this color-splashed cafe with a tart guava sangría and contemplate the possibilities. A perfectly grilled Cuban sandwich? Garlicky fried chicken with black-bean-tinted rice? Or crisp-skinned pork shoulder with fried plantains? Make it easy and get all three. Just save room for a guava-and-cream-cheese empanada with vanilla ice cream. Also good: Croquetas; picadillo (ground-beef hash); mojito. Vietnamese restaurants are known for sprawling menus, but what’s rare is a place that gets nearly everything right. We head to this spot for its intensely flavorful pho and other soups, well-crafted bánh mì, and nicely caramelized meats. Don’t forget the Maryland fried-chicken soup. Swipe the chicken into garlicky chili sauce, then dunk it in a bowl of rich chicken broth with egg noodles. Also good: Spring rolls; curry-chicken soup; roast quail; papaya salad with shrimp. The team at Myron Mixon’s—named for a veteran champ of the competitive-barbecue circuit—excels with a spectrum of meats: tender brisket with its telling pink smoke ring, honey-tinted smoked chicken, and pulled pork. Get them in sandwich or one-meat-plate form to stay within budget, or bring friends and go all-in on a family-style feast. Also good: Buffalo pork rinds; deviled eggs; ribs. Insiders know to seek out this quaint central-Vietnamese eatery tucked inside the Eden Center’s interior mall. Here, in addition to ubiquitous búns and crepes, you’ll find unusual dishes such as rolls stuffed with grilled sausage and fried scallions; congee laced with ginger; and mì quang soup with turmeric noodles, pork ribs, shrimp, and peanuts. Clay pots are all over menus in the complex, but few yield such a gorgeous base of caramelized rice—the Vietnamese equivalent of a perfect paella’s socarrat. Also good: Bo luc lac (marinated beef); squid salad; salty lime soda. Between the neon out­-line of the Taj Mahal and the wall of Indian celebrities, this dining room feels a dance sequence away from a Bollywood set. The real show, though, is on the table, where bowls keep warm atop individual flames. A “must try” label will lead you to airy minced chicken balls simmered in a marigold-colored curry. Staples such as dalare also a good measure of any Indian kitchen, and the version here is particularly dreamy. Also good: Biryani; delhi ki nehari (lamb with caramelized onions); baingan Bharta (roasted eggplant). Some of our favorite burgers can be found at this mod cafe devoted to Shaanxi-style snacks and noodles. House-made rice-flour buns hold morsels of cumin-scented lamb, red-onion-studded pork, and five other fillings, and we’d be happy downing them all. Chili-flecked pea-nuts and skewers of grilled bean curd make a fitting prelude. Also good: Skewers of lamb, pork, chicken, and beef; sesame dumplings; knife-cut noodles; cold skin noodles with vinegar and peanuts. Chef Seng Luangrath doesn’t just operate two Laotian restaurants—she started an entire movement to gain recognition for her native cuisine. It’s worked: She and son Bobby Pradachith have amassed a devoted following for their pungent, fiery cooking. 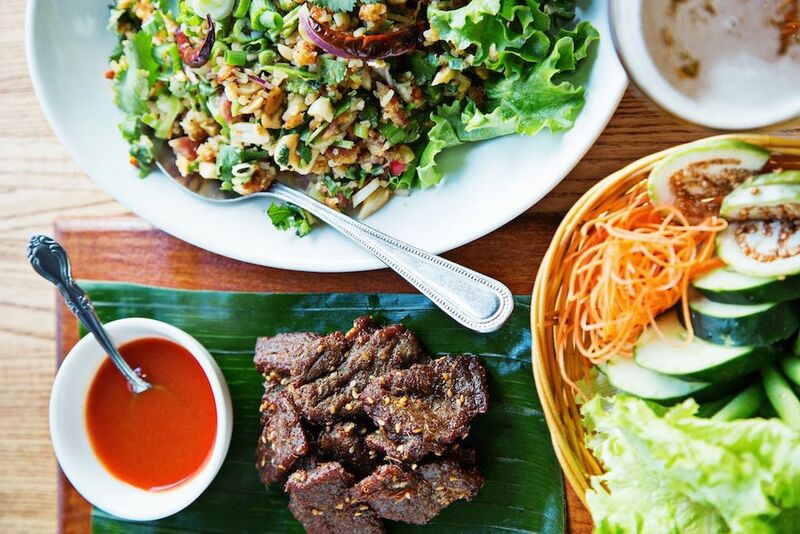 They’ve converted Washingtonians to the wonders of crispy coconut rice salad with fermented pork; minced-meat laab salads tossed in herbs and fish sauce; plus off-cuts such as grilled chicken hearts and fried pig’s ear. Also good: Pork sausage; piing (grilled marinated meats); fish steamed in banana leaves; tamarind soup. Some of DC’s best Chinese food is in a . . . Days Inn? In fact, the oddball locale has become part of the charm for Szechuan heat-seekers. Fish filet with silky tofu hides under a cover of chilies and numbing peppercorns, while bright chili oil punctuates dumplings and dan-dan noodles. But spice isn’t the only trick in the kitchen. The Chinese beef “burger” is enlivened with cumin that you’ll smell before it even hits the table. Also good: Pita soaked in lamb soup; cold wood-ear mushrooms; cold steamed noodles with sesame sauce. Scallion pancakes, puffed as big as Mylar balloons, sail through these restaurants run by the star Chinese chef Peter Chang. Take your cue from the other tables and order one—for the dough, dotted with bubbles, but also for the terrific curry dip that comes alongside. The rest of the menu channels flavors from Szechuan province and Chang’s home region of Hubei—including numbing stone-pot dishes and dry-fried eggplant showered in chilies. Also good: Cilantro fish rolls; Grandma’s Noodle; Szechuan Kung Pao chicken; mapo tofu. Best known for Vietnamese soups—five-spice-perfumed pho and bun bo hue, load-ed with pig’s knuckle, pork-blood curd, and crab balls—these lively cafes also do a stellar grilled pork chop. Along with the caramelized meat, be sure to get a bit of fried egg, pickled vegetables, pork skin, and rice on the fork before swiping the whole bite in fish sauce spiked with house-made chili paste. Also good: Crispy pork rolls; grilled-pork or house-special bánh mì. What sets this cafe apart from other Vietnamese soup shops? The ginger-laced beef broth, yes, but also house-made condiments such as lemongrass paste and chili sauce. Get your bowl with a variety of meats—we like fatty brisket, meatballs, and tripe—plus a side of pick­led onions to add to the brew. Also good: Summer rolls; oxtail pho; vermicelli bowl with grilled pork, chicken, and beef; iced coffee. Good broth is the workhorse of any worthwhile pho shop. At this Vietnamese soup joint, the house-made sate sauce pulls equal weight. The blistering, wok-toasted blend of chilies and garlic in oil perks up bowls of beef soup, but that’s just the start. The menu is a trove of noodles—rice and egg, fat and skinny, crisp and soft—many in the same preparation. Recommended for first-timers: intense duck broth with a con-fit leg, black mushrooms, and egg noodles, or strands sautéed with pineapple, cucumber, shrimp, squid and topped with more of that addictive sauce. Also good: Rice-and-egg-noodle soup with chicken broth; fat noodles with beef, mustard greens, and shiitakes. Complimentary wedges of Grana Padano–dusted pizza dough set the mood at Bertrand Chemel’s sunny Italian place. Not all dishes are inexpensive, but portions are generous and it’s easy to leave satisfied on a budget. Go for crunchy calamari, a bountiful chopped salad, or eggplant Parmesan over twirls of spaghetti. We tend to refrain from loading toppings onto the Neapolitan pies and let clean flavors—buffalo mozzarella, basil—shine. Also good: Fried arti­chokes; meatballs and polenta; capricciosa pizza;diavola pizza; Negroni. At this strip-mall Indian spot, the samosas are flakier and the pakoras lighter than others we’ve found. Dishes from the tandoor, such as chicken tangdi, are wonderfully juicy. Even the curries have more depth than you’ll typically taste. And did we mention breads? Cheese-filled naan, onion kulcha, and puffed puri all vie for the number-one slot. Also good: Goan fish curry; lamb korma; goat curry; yellow-lentil dal. It feels like a nightly party at chef Enzo Algarme’s joint, which pays homage to the thin-crust pizza and friggatorie (fried food) of his hometown, Naples. Pies cooked in the wood-fired oven can feed two. Of the 20-plus topping combinations, we like simpler arrangements, such as the certified Margherita D.O.C. Bookend your meal with a frittura sampler (arancini, prosciutto croquettes) and fresh gelato—and don’t forget the Chianti. Also good: Arugula salad; sausage-and-onion pizza; eggplant Parmesan. It’s tough to get excited about bowls. So often they start out exciting and wind up tasting one-note. A stunning exception: the Indian concoctions at this Navy Yard spot, dreamed up by Sahil Rahman and Rahul Vinod, whose dads own Indique, and served in a date-worthy setting. We’re partial to set combos such as the Aloo Need Is Love, with sweet potato, pickled radish, and tamarind-ginger chutney (among other things) on a bed of lemon rice. Also good: Samosas; “Tikka Chance on Me” bowl (with chicken tikka); Indian yogurt. Karahi is king at these joints that hum along to the sounds of Pakistani pop. We favor the fiery curry with bone-in chicken, seekh kebab, or lamb. Sop up the chili-red sauce with flatbread still steaming from the tandoor. On weekends, go for haleem, a flavorful powerhouse of lentils, wheat, spices, and chicken. Also good: Bone-in chicken tikka; deep-fried Lahori fish. Nathan Anda sources humanely raised animals and crafts clever charcuterie across most of the Neighborhood Restaurant Group eateries. At these butcher shops, his meat mastery is on display in sandwich form. The piggiest of pleasures is the “porkstrami” with thin layers of pastrami-style pork sirloin, bacon-braised kraut, and extra jus soaking into the baguette. 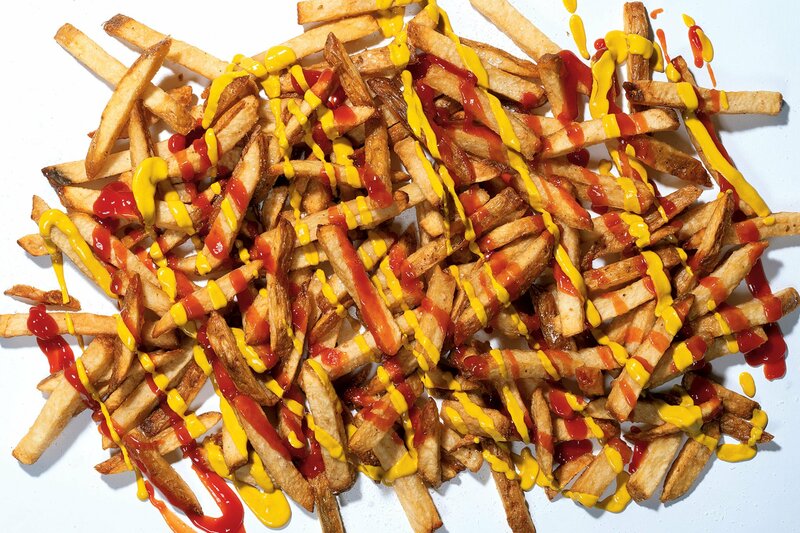 It’s best complemented with a side of aged-beef-fat fries, heavy on the garlic and rosemary. Also good: Hot Wagyu pastrami; Italian sub; tigelle breakfast sandwiches. The toughest tables to get at the Eden Center are at this chic Vietnamese bistro, no matter what time of day. For good reason: The wide-ranging menu excels with both commonplace dishes (a crackly-skinned roast quail, vermicelli topped with grilled pork) and lesser-seen discoveries, such as snails in coconut cream and a duck-feet salad. Also good: Autumn Imperial Rolls; baby clams in a clay pot; grilled beef with grape leaves; rocket shrimp; beaten-egg soda. If you’ve never tried yak, now’s your chance. The lean protein is vividly spiced and grilled at this Nepalese restaurant. Bonus: It’s “the healthiest red meat you can eat,” according to a fact sheet that comes with the menu. Other delights require less of a sell, such as the momo dumplings stuffed with goat and served with nutty tomato sauce. For those willing to stretch their budget, the restaurant serves solid cocktails with spheres of ice. Also good: wild-boar curry; eggplant curry; lamb chops. Consistency can be a restaurant’s greatest strength—and challenge, especially with a menu of 90-plus dishes. Kudos to this Thai star, which has burned bright for 20 years. Yumsalads are thrilling balancing acts—try curls of squid with lime, herbs, cashews, and dried shrimp—while house specials such as charcoal-grilled pork with chili-lime sauce are worth exploration. The airtight list yields terrific ubiquities like drunken noodles, too. Also good: Chive dump­lings; catfish with red curry; watercress salad. In a dining world where fast-casual abounds, we appreciate the slow (still casual) Yemeni food at these cozy restaurants even more. Take the haneeth—roasted lamb slowly coaxed to tenderness and set in a bed of cardamom-spiced rice. The grains and breads aren’t to be missed—especially basboussa, a sweet-savory semolina cake drizzled with honey. Also good: Shafout (chilled yogurt with flatbread); fahsa and saltah (shredded-beef and vegetable stews); lamb mandi. These 12 Peruvian chicken houses feel like fast-food joints, with their plastic trays and packaged sauces, and move with the efficiency of them, too. The constant line of customers is part of the reason the Peruvian chicken here is the area’s best—the birds never have the chance to sit around and dry out over their open flame. Also good: Plantains; alfajores cookies. A new second din­ing room means shorter weekend lines at this Persian kebab house, where bone-in Cornish hen, spiced ground beef, and salmon are the biggest draws. Don’t skip the rice dishes, accessorized with, say, candied orange peel and pistachios—we request a raw egg to mix into the hot basmati. Also good: Yogurt with cucumber; Persian ice cream; paludeh (a shaved-ice dessert). 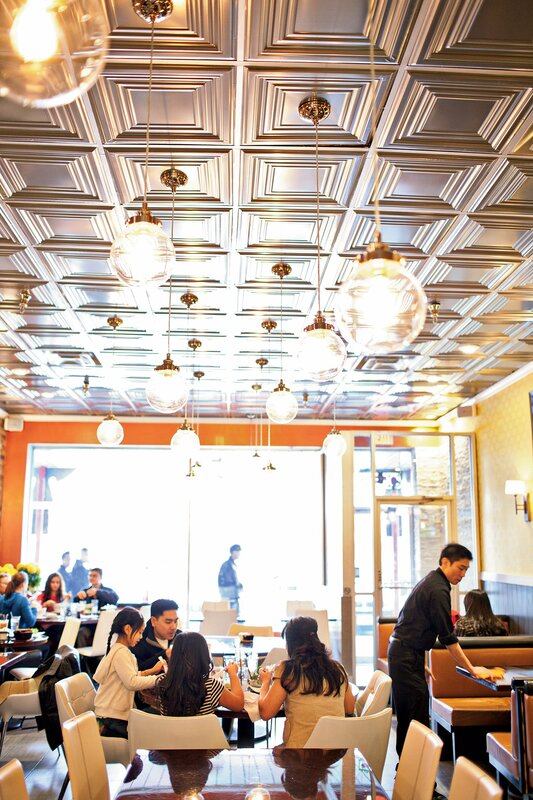 Ultra-light soup dumplings are the draw at this bustling cafe. On weekends, the place serves up a pan-fried version, less liquidy but no less delicious. Round out the meal with a salad of mustard greens and edamame, plus salt-baked ribs with noodle soup. Also good: Salty crispy fish; rice-wine-poached chicken. 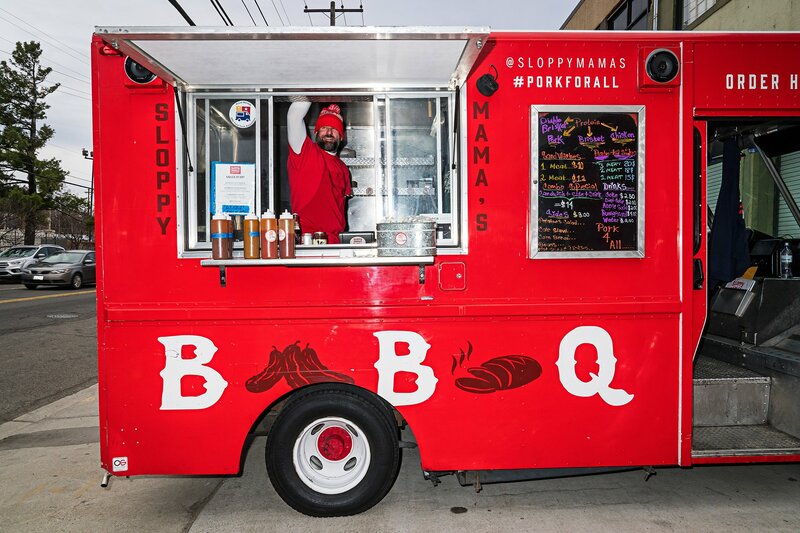 Joe Neuman’s barbecue outfit has grown in the few years since the for-mer teacher traded books for brisket—he now serves his wood-smoked meats in a stall at Union Market, inside Solly’s tavern, and in a food truck. The crown jewel of Neuman’s repertoire is his moist pulled pork, which you can adorn with house-made pickles and sauces. Also good: Fried-chicken sandwich (Solly’s only); smoked chicken. Also good: sope al pastor; crab tostada; posole;guacamole and chips. The mariachi-band figures on the roof let you know you’re in for a fiesta. This taqueria, with 20 types of ta­cos, celebrates odd bits in particular. Our favorites are the tripe, tongue, and pork cheeks. 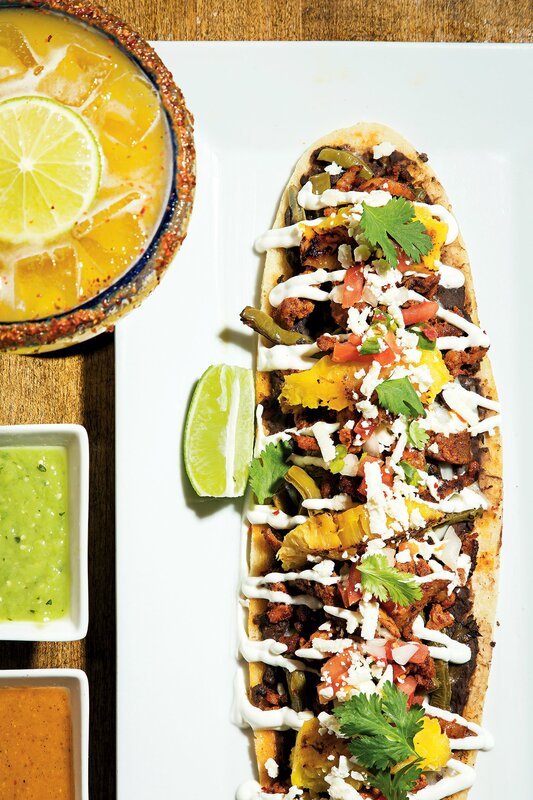 But for peak pig, try the mixed pork—a fatty, chewy medley of parts—double-wrapped in corn tortillas. A separate counter near the entrance serves fresh juices and a can’t-miss elote (Mexican street corn on the cob). Also good: Pork-skin tacos; carnitas tacos; cactus tacos. We could live on bread alone at this Lebanese dining room, whether the hot-from-the-oven pita; the spinach, cheese, and meat pies; or the Palestinian-style msakhan, cylinders of dough filled with sumac-scented chicken. Kebabs and koftas are winning, too, whether heaped on rice platters or tucked into wraps. Also good: Mezze platter; beef shawarma; ground-lamb-and-beef kebabs; pistachio baklava. This Trinidadian carryout offers different types of roti—all of which will leave you with leftovers. The most popular is the “buss up shut” (translation: bust-up shirt, because it looks like crumpled clothing), a flatbread with feathery layers perfect for dipping in goat curry. Alternately, the dhalpuri roti enfolds meats and vegetables like an oversize burrito. House-made juices, particularly the ginger-pineapple, add to the Caribbean flavor. Also good: Hot rice meal with oxtails; “doubles” (chickpea-curry sandwich with tamarind sauce). Stacked teapots lend a homey feel to the revamped dining room of this decades-old restaurant from new owner Kris Panngern, a Bangkok native. Thankfully, the lineup is still deliciously familiar. (That honey-basil duck isn’t going anywhere.) You can go whole hog on the menu—literally, we feasted on minced-pork salad with pig skin plus a pig-knuckle stew—but the kitchen delivers across the board. Also good: Squid salad; sour pork sausage; steamed dumplings; mango with sticky rice. The restaurant-inside-a-market trend is hot, but there’s nothing fleeting about Phak “Kob” Duangchandr’s eatery at the back of an Asian grocery. You could spend a week eating through the menu. Our short­cut: We share the appetizer sampler plus khao soi and a whole fried snapper under a planter’s worth of herbs. Also good: Basil fried rice; duck noodle soup; jungle curry. If you have Neapolitan fatigue, elbow your way to a picnic table at this Petworth hot spot. In the open kitchen, chef Daniela Moreira creates an almost magically pillowy dough and arrays her rounds with farm-fresh veggies, herbs, and pickled peppers. Pizzas are big enough to share—throw in a salad and a glass of rosé and call it a date night. Also good: Empanadas; Bentley pizza (soppresatta, Peruvian peppers); “Pretty in Pepperoni” pizza; ice-cream cones. DC has no shortage of ramen shops these days, but if you’re a fan of ultra-porky broths, a stool here is where you want to land. Adding to the soups’ rich factor: curly noodles with just the right chew, runny eggs, and meats such as braised pork and fried chicken (pickled ginger keeps the heartiness in check). One bowl is worth a meal (or two), but it’s hard to resist a round of pork-cheek bao—or chocolate-chip cookies dunked in red miso. Also good: Red-miso ramen; Toki Classic ramen. Pakistani street food gets the fast-casual treatment at these art-filled cafes. Among the roti wraps, we like the malai murghi, a roll-up of yogurt-marinated chicken and green chili paste. Bun kebab is the kitchen’s version of a burger, with a spice-laced patty and a side of zesty fries. Also good: Beef or lentil samosas; channa masala with rice and yogurt. There’s almost always a line outside of this Korean comfort-food joint specializing in fried or broiled fish and hearty soups. The curt but efficient staff will take your order while you wait so that the food arrives as soon as you sit. Most tables go for the bo ssam, fatty slabs of steamed pork that you can wrap in cabbage with daikon kimchee and garlic, but don’t miss the kalgooksoo soup with chewy hand-rolled noodles. Also good: Boodae jeon gol (stew with rice cakes, ramen noodles, kimchee, and hot dog); seafood pancake with peppers. Have friends who won’t shut up about how pizza is so much better in New York City? Get them to pipe down with a trip to these storefronts (and a GW University stall), where one slice can equal dinner and a single pie could serve a party. The places get pretty wild with toppings, and some (e.g., chicken Parm or Korean chicken pizza) are more successful than others (paneer tikka). You’ll make your best case with the basil-strewn Margherita or the puffier, square Grandma pizza—both show off the enviable crust and excellent red sauce. Also good: Supreme pizza; pepperoni pizza; buffalo-chicken pizza; garlic knots with red sauce. Whatever you do at this southern Indian vegetarian restaurant, get a dosa. The plate-eclipsing crepe comes with stuffings such as potatoes and onions, plus four chutneys. Spongy disks known as idli, studded with cashews, further showcase the kitchen’s dough-making prowess. And who needs meat when you have paneer mirch ka salan, a Hyderabadi specialty with cottage cheese and jalapeños in a peanut-and-tamarind gravy? Also good: Panipuri (wheat shells with potatoes and chickpeas); baingan bharta (eggplant); malai kofta (vegetable dumplings). It’s a cash-only strip-mall joint with a packed parking lot, but that’s where the complaints end. Take a seat in the rustic-cool dining room and you’ll be given a cup of cucumber-scented water. 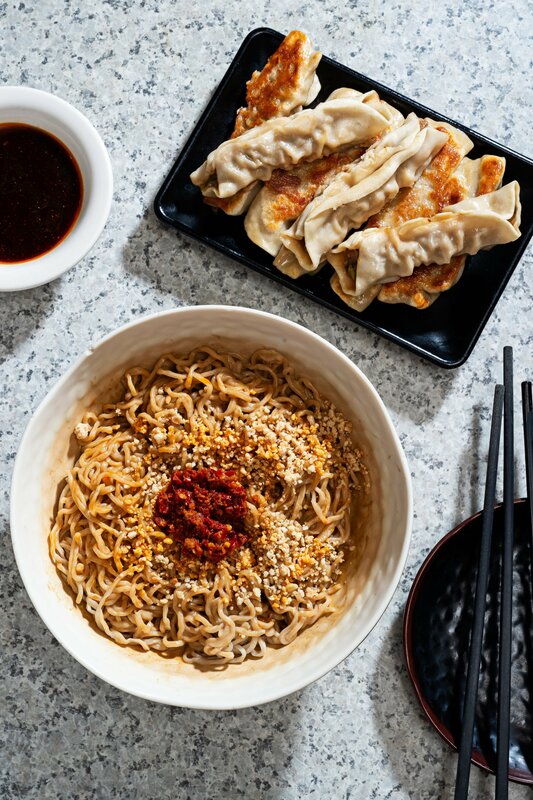 Then peruse the menu of house-made noodles, which range from mellow (a toss of sesame paste and scallions) to singeing (destination-worthy Yibin noodles, with chili oil, ginger, and peanuts). Don’t bypass the condiments—pots of brown-rice vinegar amp up bowls nicely. Also good: Cold black fungus; hot-and-sour rice noodles; Chongqing small noodles.